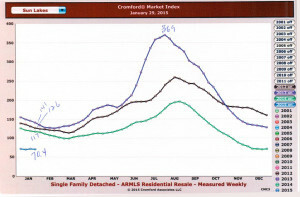 Sun Lakes AZ | Real Estate Market Update is complete for January 2015. Currently 243 homes are actively listed for sale in this Robson developed active adult community. Sun Lakes is comprised of Sun Lakes Country Club, Cottonwood – Palo Verde and IronOaks (Ironwood and Oakwood). Homes are selling but at a slower clip than in 2014 at this time. January 1 – January 31, 2015 – 32 homes sold with an average sales price of $237,722, sales to list price ratio of 95% and average sales price per square foot of $121.92. Average days on market was 66. January 1 – January 31, 2014 – 50 homes sold with an average sales price of $210,450, sales to list price ratio of 97% and average sales price per square foot of $117.82. Average days on market was 53. 56% fewer homes in January 2014 over 2015. Why the Decrease in Sun Lakes Sales? 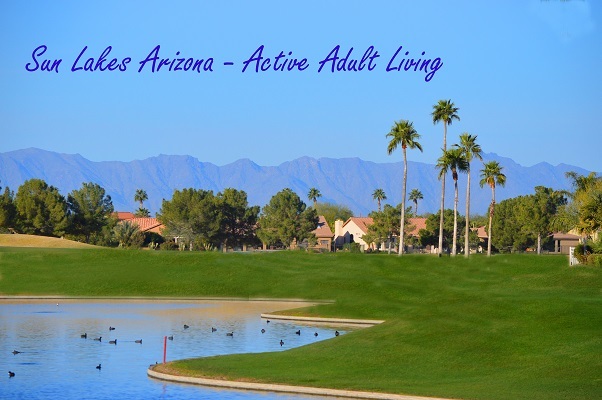 ACTIVE LISTINGS Let’s take a look at the active listings report from Cromford Associates, a company that tracks real estate in Arizona on a daily basis. This report shows week 4 in January 2015 with 214 active listings. Compare that to 2014 when there were only 159 homes listed for sale. That represents an increase in inventory of 35% more homes for sale in 2015. Inventory was lower in 2013 with just 185 homes for sale. 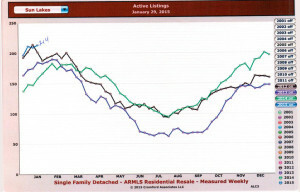 We are higher in inventory than the 2012 level of 202 homes. Inventory is highest in the strongest selling season months of January through March. Inventory drops continually through the summer months and increases gradually in the fall. Clearly buyer demand is weak in Sun Lakes AZ. 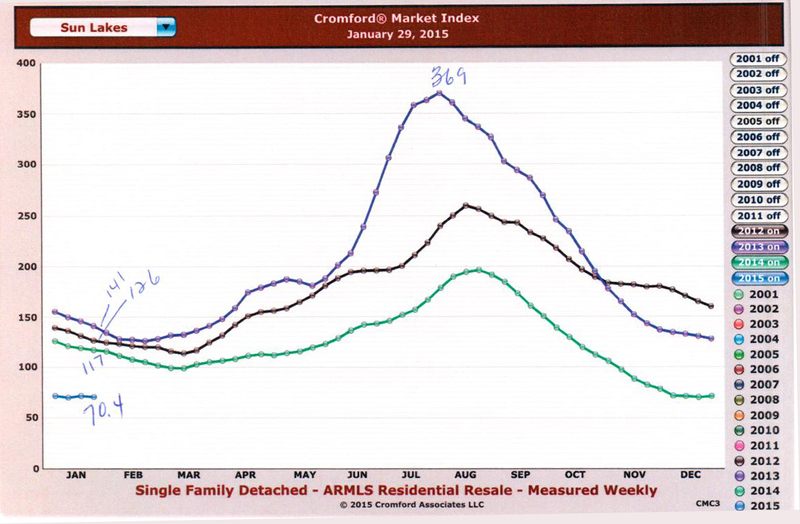 The Cromford Index at 100 is a neutral and balanced market and neither a buyer or sellers market. The further above 100 represents stronger sellers market and the same is true when the market falls below 100 and it becomes a buyers market. Not the index of 369 in August 2013. Inventory was extremely low with fewer than 90 homes for sale. Sun Lakes has just under 10,000 homes in the community. Measuring the index in January 2015 is the lowest in four years at 70.4. Compare that to January 2014 at 117, 2013 at 141 and 2012 at 126. An increase of 35% in active listings and and weak buyer demand as represented by the 70.4 index is creating a buyers market for homes in Sun Lakes Arizona. Why are Some Homes Selling and Others are Not? Sellers must look at where their home is located. Does it back to a major road where noise will be a factor for a buyer? Does it back to industry or commercial real estate? In Sun Lakes some buyers want a golf course lot with water view and no cart path nearby. Those are limited but certainly demand more value. It is important to consider the home location when pricing it to sell. This is a big one. Buyers are looking for two things. They either want a home that has been upgraded and is move in ready or they want a deal on one that they will have to upgrade. When pricing a home to sell, The Kolb Team will provide a range of pricing. If the home has a great location and is upgraded the seller can go to the top end of the range. If either condition or location is poor the lower end of the range is more accurate. Most every seller wants to price their home above where the REALTOR recommends because they feel there should be room to negotiate. That is typically not a good decision. A good REALTOR will negotiate on the seller’s behalf. In our market today, buyers have access to the same information real estate agents do. They are savvy and usually know a home’s value. It is up to the seller’s agent to justify the price with comparable homes that have sold and with upgraded value for things such as remodels, pools, premium golf course lots, etc. Pricing a home too high will result in the home sitting and days on market are lethal to a seller. Or, it will result in price decrease after price decrease leaving the buyer with the feeling that this may be a distressed sale. Pricing your home accurately is very important to getting a home sold. Sun Lakes Arizona remains a top choice for those looking for homes in an active adult community. Location is one factor with both Sky Harbor International and Mesa Gateway Airports nearby. All major freeways including the I-10, 101 and 202 are within minutes of Sun Lakes. Restaurants, major shopping centers, theater, medical facilities and museums are all a short distance away. If you are thinking of buying or selling a home in Sun Lakes Arizona, call The KOLB Team at 480-440-0849. We are Sun Lakes residents and specialists. For information on selling your home in Chandler or Sun Lakes Arizona simply fill out the short form below and we will contact you!